There’s a cool new trend where famous people give out their Snapchat names, and us normal folk get to eagerly await their updated stories so we can pretend—if only for a few minutes—that we’re really all just close friends and that Steve Aoki personally Snapchats us. Because he does. We swear. The HBT Crew took a moment to single out the 10 DJs with the best Snapchats, so you can all share in on the delightful quasi-fame sensation we’re high off of. Whether you love him for his music or his beautiful long locks (bearing a striking similarity to HBT Crew member Taylor’s hair after a rave), nobody can deny that Steve Aoki is quite the memorable character. He’s still a little new to Snapchat, but his selfie game is strong and we have great faith in his potential. 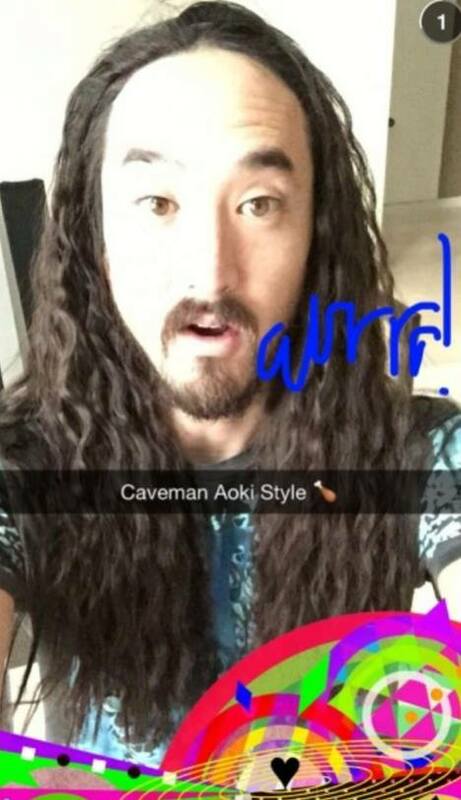 You had better keep us updated on tour for your new album, Neon Future, Steve! We also maintain the statement that you personally Snapchatted us. (If you are interested in actually personally Snapchatting us, that could also be arranged). Oh, Tiesto. Thank you for all the times you sent Snapchats of your awesome life on tour and of yourself partying with girls in skimpy bikinis. They truly always brightened our day. Tiesto’s the DJ you should follow if you’re into the EDM lifestyle but feeling a little too lazy to implement it in your own life, and are completely happy living vicariously through someone else’s debauchery. A-Trak keeps his Snapchats mostly selfies or cool #FoodPorn pictures, so he’s the ultimate for the whole “is-this-a-famous-DJ-or-is-this-my-friend” confusion. Keep up the good work, buddy. But wait—is that a hint of duck-face we see in your Festivus selfie? We’ll send you our notes. The talented Dutchman stepped into social media full-force, and always keeps his Snapchat updated and exciting. Not that many inappropriate partying selfies, but still—he’s well worth the add. Fun fact: Afrojack is 2.08 m tall. Another fun fact: a member of the HBT Crew (who will remain nameless) did not know the difference between Afrojack and Afroman. Yet another: that HBT Crew member was Alex. She is deeply sorry for the mix-up. Shout-out to Alesso for being the DJ with the most music-related Snapchats! (A DJ with music-related Snapchats?! Madness.) Alesso’s the one to follow if you actually only want relevant Snaps; he mostly sends behind-the-scenes footage of his live shows or teasers of his new music videos. We’re not really sure if he’s the one running the account, but it’s cool for updates nonetheless. Why add 3lau? In one word: shoes. HBT has a sweet spot for stylish DJs, and 3lau’s shoe collection more than makes the cut. There are a few studio Snapchats breaking up the stream of shoe pictures, but we’ve decided to forgive him for that. The fun fact stream continues: 3lau is actually pronounced Blau. Which HBT Crew member didn’t know that, you ask? Alex. It’s always Alex. The #1 perk of being famous is being able to send utterly ridiculous Snapchats and nobody being able to judge you, because you’re famous. If no one else, we know Calvin Harris would undoubtedly agree with us. In the spirit of Calvin’s whimsical Snaps and HBT’s unanimous decision to rip on our team member Alex, we’d like to announce her love for the Scottish beauty. Keep an eye out for Calvin’s weird/hilarious Snapchats—you know Alex will. #ChipotleGang or die. Since joining the Snapchat world, Carnage has kept his fans updated on his culinary adventures at Chipotle (and occasionally sends pictures of his performances and such). Carnage- and Chipotle-lovers rejoice! Check out his Snapchat for a steady stream of food and music. But mostly food. Taylor, HBT’s resident Chipotle expert, wholeheartedly approves. Hands down the funniest DJ on Snapchat. He uses his account to leak previews of his new tracks, but we’re really following him for his hilarious faces and captions. He really gets us. That’s exactly the face we make when we’re feelin’ ourselves. The beloved Diplo is finally on Snapchat! Keep an eye out for his stories if you’re looking for a perfectly PG and totally respectable feed of a man travelling around the world and doing what he loves. Thank-you Diplo for your beautiful smile, and stay creative. Don’t have a booking agent? No Problem! Here are 5 startups that will help you book your next gig! EDC is on its way to japan 2016!